This is a continuation of a project I started about 2,5 years ago when I worked on a mosaic of Messier 106, made using images of the Hubble Space Telescope. In 2015 I found some new data sources on the internet, including some huge telescope databases with data from professional telescopes. That’s when I decided to see if there would be more field of view possible for this image. Then I found highres (0.18″/pix) data from the Canadian-French-Hawaii Telescope, located at Mauna Kea. The image shows galaxies up to a magnitude of +25. Literally thousands of galaxies can be observed in the background. After finding this data I got in touch with Roberto Colombari, Robert Gendler, Jay Gabany and Fabian Neyer. Roberto and Robert made an image together of M106 (http://www.astrobin.com/154455/) with a comparable field of view using another dataset and with their permission I combined their color data with my previous image to get more color detail in the image. Furthermore Jay Gabany had a great H-alpha image (http://www.cosmotography.com/images/small_close_ngc4258.html) of the galaxy. I combined this image together with h-alpha data from the CFHT telescope to make the ‘hidden’ arms of M106 visible. These arms are clearly visible in radio- and x-ray imagery, but are almost invisible in the visible light, except in H-alpha. In 2016 I did a further enhancement on the data creating more visibility for the weak structures surrounding the galaxies and enhancing the dust lanes using data from Fabian Neyer. M106 core and NGC 4248 (lower right) were made using Hubble Space Telescope data. 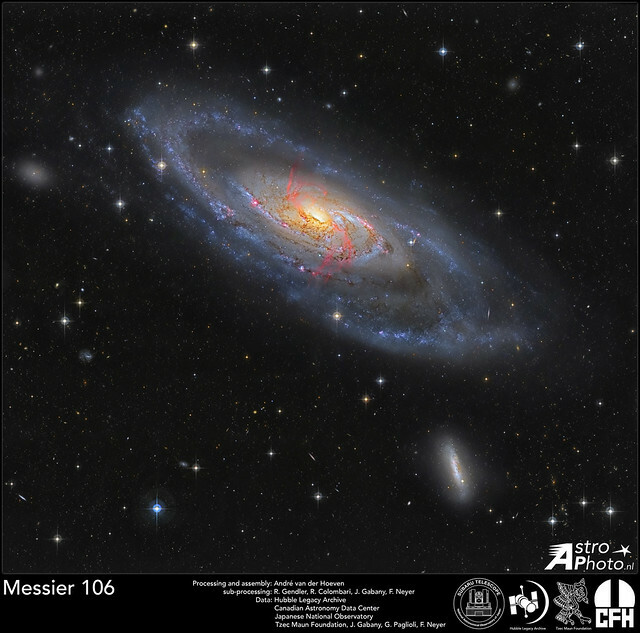 Colors of the M106 core were imaged by the 1m telescope of the Tzec Maun Foundation in Cloudcroft, NM and the overal color was combined with the image of Roberto and Robert. H-alpha data was kindly provided by Jay Gabany. Several details made by the 8.2m Subaru telescope in Hawaii. Nebulosity surrounding M106 by Fabian Neyer. Pierre Méchain discovered this galaxy in July 1781. He wrote a letter in 1783 to Bernoulli mentioning the discovery. He also sent his discovery to Charles Messier, but he never added it to his famous Messier catalogue. It was only in 1948 that this object was added as M106 to the catalogue. M106 is accompanied by the much smaller galaxy NGC 4248 (just below M106). constellation Canes Venatici. It is a spiral type galaxy and has a diameter of about 135 000 light-years. The spiral arms extend clearly out of the bright core and active star formation areas can be recognized in the arms. M106 has been classified as a Seyfert galaxy with an active nucleus, showing emissions in the X-ray spectrum. The core probably contains a massive black hole with a mass of over 40 million solar masses. This is about ten times the mass of the central black hole in our own Milky Way. Recent images acquired by the Chandra X-ray observatory have revealed two extra spiral arms previously hidden from optical observations.